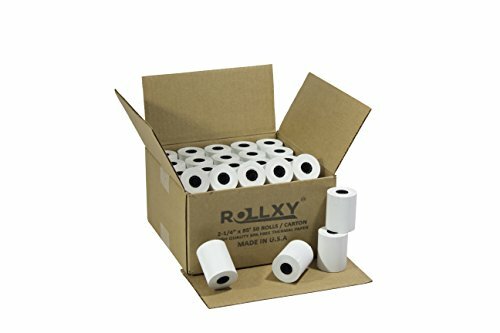 This Thermal Paper Fits: Casio CE-T100, Casio PCR-T465, Casio PCR-T2000, Casio TE-2000, Casio TE-3000, Casio TE-4500, Casio TE-7000, Casio TE-8500 Celerex CX 1000 Remote Terminal Citizen CBM262, CBM270 EBW Auto Stik 950 EMCO/Wheaton Tank Monitor II First Data FD50 Hypercom I.C.E.4000, Hypercom I.C.E.4000CE, Hypercom I.C.E.5000, Hypercom I.C.E.5500, Hypercom I.C.E.6500 Hypercom T7P-T LinkPack 3000, 9000, 9100 MagIC 6000 Nissan Monitor Nurit 2080, Nurit 2085, Nurit 2090, Nurit 3000, Nurit 3010, Nurit 3020, Nurit 5000, Nurit 504, Nurit 505, Nurit 8320 Omni 3200 series, Omni 3210, Omni 3300, Omni 3730, Omni 3740, Omni 3750 Omniprint J.C. 1160 Series, OM20 Oneil 2t, 2te Royal Alpha 583CX, Royal Alpha 600SC, Royal Alpha 9155SC Samsung ER-265, Samsung ER-285M, Samsung ER-380, Samsung ER-380M, Samsung ER-390M, Samsung ER-650, Samsung ER-650R, Samsung ER-650SS, Samsung ER-5200, Samsung ER-5215, Samsung ER-5240, Samsung STP-103, Samsung STP-131 Schlumberger MagIC 6000, MPT/ICC SII Sharp 01PU, Sharp 01PU, Sharp ER-A450T, Sharp UP-700, Sharp XE-A201, Sharp XE-A202, Sharp XE-A302 Standard Register S40 Talento Dassault Veeder Root TLS350 Verifone Omni 3200, Verifone Omni 3210, Verifone Omni 3300, Verifone Omni 3350, Verifone Omni 3740, Verifone Omni 3750, Printer 350, Verifone Printer 355, Verifone Printer Tranz 420, And many more! If you have any questions about this product by PosPaperRoll, contact us by completing and submitting the form below. If you are looking for a specif part number, please include it with your message.